Tory and Lib Dem peers are expected to continue their battle against plans for a new offence of "glorifying" terrorism despite MPs backing the measure. The government comfortably won a Commons vote on the issue on Wednesday overturning an earlier Lords vote. But the Terrorism Bill will now return to the House of Lords in what could develop into a major stand-off. Tony Blair's reluctance to compromise has angered Tories and Lib Dems who say a deal was there for the taking. But the prime minister said the vote was a "signal of strength" and the government had "won the argument" on fighting terror. Opponents say existing laws - and plans for a new offence to prevent indirect encouragement of terrorism - mean an offence of glorification is not needed. The government says the clause is needed to act against organisations which try to promote terrorism and create an atmosphere where impressionable young men think suicide bombings are a "noble and holy activity". Lord Thomas of Gresford, the Lib Dem home and legal affairs spokesman, said he had voted against the new offence when it first appeared and planned to do so again. "It's no part of the criminal law to send messages to people," he told BBC Radio Five Live. "The purpose of the criminal law is to create a framework within which people can regulate their conduct and know what the penalty will be. "It has to be very well and clearly defined. Now, what on earth does glorification mean and what is the impact of the use of such a word upon the legislation?" The Conservatives have yet to declare exactly how they will vote when the bill returns to the Lords on 28 February. But shadow attorney general Dominic Grieve has already said Tory peers will try to improve the bill. And shadow home secretary David Davis has pointed to the coalition of former law lords and ex-Cabinet ministers, some of them victims of terrorist attacks, ranged against the glorification offence. If peers continue to oppose the plan, there could be a battle of wills, with the bill bounced between the two Houses of Parliament until one side caves in. The proposed offence forms part of the Terrorism Bill which was introduced after July's London bomb attacks. The Commons debate also saw MPs reverse another change imposed by the Lords. MPs said police should not need a warrant from a judge to be able to tell internet service providers to remove terrorist material from websites. Mr Blair said dropping the glorification offence would send the "wrong signal" about the UK's determination to tackle terrorism. But the Tories accused ministers of trying to grab headlines rather than create watertight laws. Scotland Yard's anti-terrorism chief Peter Clarke on Thursday said it was "hopelessly optimistic" to think the threat from al-Qaeda could be under control within five to 10 years. Mr Clarke, the deputy assistant commissioner of the Metropolitan Police, said there were more than 60 defendants awaiting trial on terror charge - an "unprecedented" number. He also suggested there should be a new national structure to police terrorism. 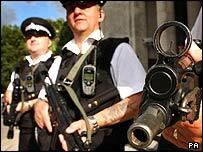 Currently only police in London have substantial resources for tackling terrorism.